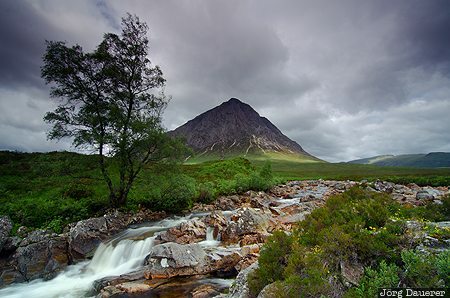 Dark clouds above the pyramidal mountain Buachaille Etive Mor (also known as The Buachaille) at the head of Glen Etive with a small creek in the front and a lone tree. Glen Etive is in Scotland, United Kingdom. This photo was taken in the morning of a cloudy day in June of 2013. This photo is in the Photo Calendar "Scotland". This photo was taken with a digital camera.